Does the Ordway have seat belts? This may be the year we’ll need them, as the Minnesota Opera’s 2008-09 season puts the “grand” back into “Grand Opera.” While one new, contemporary work is slated, the other four composers—Verdi, Mozart, Gounod, and Rossini—are household names to anyone who’s even a tiny bit infatuated with the art form. And for those who are not—yet—this season’s lineup was made for you. Thanks go to Artistic Director Dale Johnson, who plans these things about a hundred years out—except when he doesn’t. 2008 was slated to open with Aida, till fiscal responsibility loomed its tsk-tsking head, and instead, Verdi’s equally grand but more manageable Il Trovatore rose to the top. It puts forth similar vocal demands, so the cast Johnson had signed was more than prepared to do it justice. “They’re big-voiced Russian singers, who often come from the school of ‘march to center-stage, and belt your big number,’” Johnson explained. But you can bet your anvil they won’t be catatonic here. Familiar? You betcha. The first act features the bang-bang-bang-a-bang of the famous Anvil Chorus, then continues with a “good, old-fashioned, 19th-Century Verdi” stew of love, lust, murder, sacrifice, revenge—and, of course, the wrong baby being tossed into the flames. Standard stuff, in other words. Next up: Mozart’s fizzy Abduction from the Seraglio, last seen here in 1979, and set, this time, not in a seraglio (read: harem), but on the Orient Express in the Roaring ’20s. “It’s fun, silly, and fast-paced,” Johnson declares. “And the St. Paul Chamber Orchestra will be in the pit: two for the price of one. Faust, to be staged in January, hasn’t been seen here in a decade. At its peak, it was the world’s most popular opera, and then slipped a bit on the charts. This new Doug Varone production (he’s bringing his dancers, too) should remedy that. Paul Grove, whom Johnson deems “one of the great tenors of the world,” sings the title role. Judith Howarth, who sang her first Butterfly with the company, returns for her first Marguerite, the reason Faust sells his soul to the devil. If “the devil made me do it,” blame hunky Kyle Kettleson, maybe opera’s sexiest villain. The season’s finale, also a last-minute selection, is probably the best-loved comedy of all time, Rossini’s The Barber of Seville. Johnson originally had planned to end the year with the start of Donizetti’s “three queens” cycle, but hold your (war) horses: Instead, it’s slated to debut the following year. The finale promises to be the company’s final revival of the wildly popular Barber production, which was well-received both here and on tour. 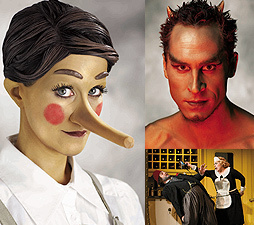 Before Barber, coming to the fore of the tried-and-true, is Pinocchio in its American premiere. It debuted to great popular and critical acclaim at Opera North of England in December. With music by Jonathan Dove, it’s “fast and fun—a very adult show” that harks back to the original work before Disney got its saccharine mitts on it. So’s the entire lineup. Season ticket sales are ahead of last year. And, like last year, each production will host a preopening Out at the Opera Night for the GLBT crowd. The first event, preceding Il Trovatore, will be September 17, 6:30 PM, at the Ordway, where fans can mix and mingle over cocktails and a sneak intro before enjoying the production itself. For tickets, call (612) 333-6669, or visit www.mnopera.org.